Ronkonkoma, NY, 2011 – Photographers: Have you been good this year? Sigma Corporation of America wants to check some photography gear off your wish list this holiday season. The leading researcher, developer, manufacturer and service provider of some of the world’s most impressive lines of lenses, cameras and flashes, is tapping into its online fan base this Cyber Monday, November 28, by kicking off the “Dear Sigma” Contest at 12 p.m. ET. Photographers are invited to visit the Sigma Corporation of America Facebook page and click on the “Contest” tab to enter the contest through Dec. 16 at 12 p.m. ET. Participants will be required fill out an entry form and draft a “Dear Sigma” letter describing what Sigma products they’re dreaming of this holiday season. Do you need some inspiration for your “Dear Sigma” Contest holiday wish list? 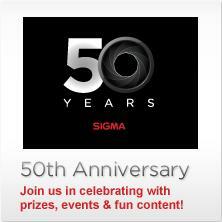 Click here to see what some of the PhotoPlus Expo 2011 attendees asked Sigma for this year. Once all of the submissions have been received on Dec. 16, online voting will commence until Dec. 21 at 12 p.m. ET. The top five vote-getters will become the contest finalists and a winner will be selected on Dec. 22 by a panel of judges from Sigma Corporation of America. The winner will receive his or her wished-for Sigma products totaling up to $2,500 of the manufacturer’s suggested retail price (MSRP). For information about the “Dear Sigma” Contest or the full contest rules, visit http://tinyurl.com/DearSigma. For information about Sigma Corporation of America, visit www.sigmaphoto.com. For 50 years, Sigma Corporation’s expertise and innovation has driven the company’s core philosophy of “knowledge, plus experience, plus imagination,”with anemphasis on producing high-quality, high-performance photographic technology at moderate prices. This family-owned organization is the largest, independent SLR lens manufacturer in the world, producing more than 40 lenses that are compatible with most manufacturers, including Sigma, Canon, Sony, Nikon, Olympus and Pentax. Sigma Corporation also produces digital SLR cameras and high-definition digital compact cameras. The company is headquartered in Japan, with offices strategically located throughout Europe, Asia and North America. For information, please visit www.sigmaphoto.com. This entry was posted in Brand: Sigma, Photography Articles & Videos, Uncategorized and tagged DSLR, Lens, Sigma. Bookmark the permalink.